Back to flowers, I’ve gone back to buying them again. For a while, I boycotted supermarket flowers because of the chemicals and pesticides they’re usually grown with. But sometimes, we need a dose of fresh fragrance and life in the middle of winter. For eco-certified flowers, you can go to Organicstyle.com (yes, that was the name of the magazine I launched years ago; I sold them the URL—for a good cause…shopping!). They have an awesome selection, and flowers make the best gifts for people, even yourself. But on my counter now I have the first hyacinths of the season that I picked up while food-shopping. What I love about hyacinths is their intense scent, and the fact that around here they are always sold with the bulb still attached, which you can plant after the blooms die. I have a whole patch of hyacinths that have “risen again” every spring since I bought them. So while they may not have been organic when I first bought them, they are now! This is the perfect time of year to start planning and ordering flowers for this year’s garden. Sure, you can wait and go to a nursery in the spring and buy stuff already chosen and overly grown from chemicals, but the true gardener pages through catalogs and dreams and learns and plans and either orders seeds or “starts” or pots of perennials that come in the spring ready to plant. Although, I must confess, there are more and more good nurseries that sell healthy plants—and I do love to buy my plants that way—the fact is it’s still winter, and those nurseries are shut down or bare right now. Some great catalogs for getting some midwinter flower power from are White Flower Farm, Wayside Gardens, Seeds Savers Exchange, Seeds of Change, Heirloom Roses…. And that’s just a partial list. One of my other favorite things about flowers is the messages I am learning they have for us. We feel drawn to specific flowers for reasons, I believe, whether it’s for healing or comfort. My favorite book for understanding that is Ted Andrews’ Nature-Speak. 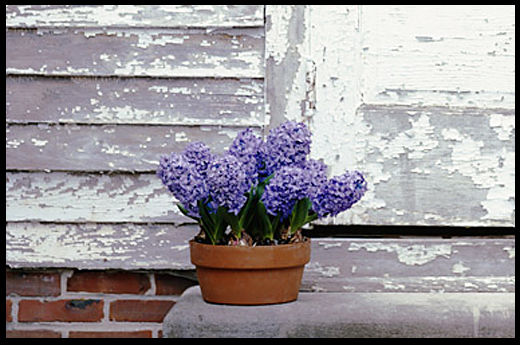 For instance, regarding hyacinths, he says they symbolize overcoming grief and jealousy, and using gentleness as a power. I’ve certainly had my share of grief. And for me, it’s nice to be reminded that gentleness can be powerful (in a culture that celebrates force and aggression as the dominant power). Just like the strong but gentle fragrance of the hyacinth that now fills my kitchen in the middle of winter. I too, love to smell hyacinths. I usually get mine from Trader Joes, along with daffodils (miniature) and crocus and some form or the other of paperwhites. I bring them home after food shopping, and spread them around the house so that I can get the perfume everywhere I sit or stand. Ah, springtime. Although winter haven’t been too bad, I am looking forward to spring, and getting out cleaning and planning in the yard. This will be difficult to do this year because, I am planning on moving. Here’s hoping my next house have a nice lot, so that it can accommodate a nice vegetable garden. Wish me luck!